15th August 1916, aged 27. A telegraph linesman from Callington, South Australia, prior to enlistment, he embarked with the 9th Reinforcements from Adelaide on 7 February 1916 aboard HMAT Miltiades for Suez. In early April he was transferred to the 50th Battalion which relocated to the Western Front by mid-June 1916. 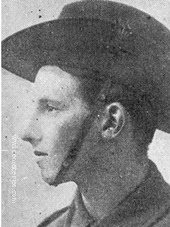 Pte Earls was wounded in action near Albert on 15 August 1916, died of these wounds later that day. 14th August 1916, aged 21. 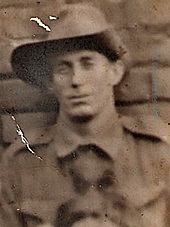 Son of Arthur and Caroline F. Fry, of "Denegully," Northcote Rd., Lindfield, New South Wales. His brother Dene Barrett Fry also fell and is buried at Beaumetz-Cross Roads Cemetery. A supercargo officer on a merchant ship prior to enlistment, he embarked from Sydney with the 10th Reinforcements on board HMAT Ballarat (A70) on 6 September 1915. 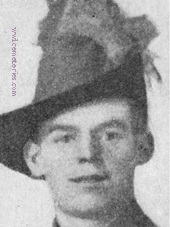 Fry was promoted to the rank of Lance Corporal (L Cpl) in Early May 1916. L Cpl Fry was wounded in action on the 13 August and died from these wounds on 14 August 1916. Son of William Mylam Nicholas and Marie Garling of Angledene, Burns Bay Rd., Longueville, Sydney, New South Wales. Prior to his enlistment in the AIF on 20 August 1914, he served with the 44th Battery, Australian Field Artillery. 2nd Lt Garling embarked from Sydney aboard HMAT Argyllshire on 18 October 1914. He later served with the 10th Field Artillery Brigade (FAB) as a major. He died of wounds at Millencourt, France, on 5 April 1918 aged 24. Pictured from the left, a 1918 portrait of Terence Garling in London,shortly before he returned to France prior to his death. The original grave of Terence Garling and his headstone. 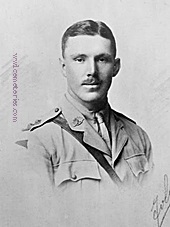 Stewart Murray Hansen M. C.
7th February 1917, aged 24. Son of John G. and Agnes C. Hansen, of 72, Pasco St., Williamstown, Victoria, Australia. From Williamstown, Victoria. 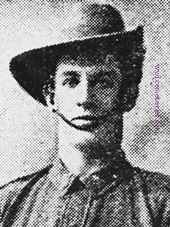 A 22 year old architect prior to enlistment on 1 October 1914, he embarked for overseas as a Sergeant with H Company from Melbourne on 22 December 1914 aboard HMAT Ulysses. He was appointed a Second Lieutenant on 27 May 1915, a Lieutenant on 20 January 1916 and a Captain on 1 March 1916. 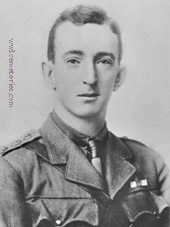 Capt Stewart was awarded a Military Cross (MC) of his initiative and gallantry on 26/27 August 1916 at Mouquet Farm, France and was then wounded in action at Gueudecourt, France on 5 February 1917. He died of those wounds on 7 February 1917. 2nd September 1916, aged 20. Son of Ernest George and Kathleen Hayes, of Colonial Treasury, Sydney. A university student prior to enlisting, he embarked from Melbourne aboard HMAT Ballarat (A70) on 9 August 1915. He died on 2 September 1916 at the 2/1st South Midlands Field Ambulance Station, Warloy, France, of wounds received in action, on 1 September 1916, aged 20. 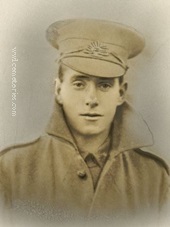 22nd August 1916, aged 22. Son of John Jeremiah and Mary Ann Keast, of Longland St., East Brisbane, Queensland. Of Brisbane, Qld. Son of John Jeremiah and Mary Ann Keast. A moulder prior to enlisting he embarked from Brisbane aboard HMAT Rangatira (A22) on 25 September 1914. He died in France on 22 August 1916 of wounds received in action, aged 22.